Major efforts are under way to develop new, high-efficiency, cell-based expression systems and flexible low-cost biomanufacturing platforms for biotherapeutics and vaccines to drastically reduce development and manufacturing times. The industry’s enormous growth is driving many of these efforts. The global market for biotherapeutics now stands at $80 billion. Resurgent interest in vaccines is coupled with recent failures in current vaccine manufacturing technologies and the advent of cell-based vaccine manufacturing. The emerging class of follow-on biologics will create additional demand for new, cost-efficient manufacturing platforms. Less visibly, government has become a driver of new biomanufacturing technology as well. Many governments now recognize that manufacturing systems that can be deployed rapidly and flexibly are integral to responding to pandemic or biological threats. Current vaccine and protein manufacturing systems have a number of limitations that represent significant biodefense vulnerabilities. Stockpiling, the norm for known biothreats, requires repeated production due to limited product shelf-life. In addition, the stockpiles themselves are vulnerable. Facilities are also vulnerable because they are fixed. Further, the identity of novel biological threats is likely to be unknown, precluding stockpiling as a biodefense strategy. Most significantly, current scale-up and manufacturing processes are too slow to adapt to manufacturing novel countermeasures, and it can take years to produce significant numbers of doses. Last year, the US Defense Advanced Research Projects Agency (DARPA) launched an ambitious program called Accelerated Manufacture of Pharmaceuticals (AMP), which is specif ically aimed at developing ultrafast new biomanufacturing technologies. According to DARPA, “Our military’s operational readiness and need for specific vaccines and monoclonal antibody (MAb) therapies requires a radical solution to replace the current slow scale-up and manufacture of these life-saving pharmaceuticals.” The AMP program has potential both to increase US preparedness and, if successful, to help transform commercial biomanufacturing. The AMP program set a series of aggressive goals in a three-phase effort to address the above-mentioned limitations. The first phase of the program was funded in 2007. Its goals include condensing drug manufacturing timelines, encouraging use of flexible and mobile production platforms, and achieving production at low cost to address novel biothreats. Condensing the drug manufacturing timeline from months-to-years to weeks-to-months: Specifically, the program calls for a system “capable of producing three million doses of GMP-quality vaccines or MAbs within 12 weeks” (starting with cDNA). Flexible and mobile large-scale production platforms could be distributed anywhere in the world by land, sea, or air such that manufacturing supply of vaccine or countermeasure supply can be delivered locally. Novel agents: It’s important to be able to manufacture products that address novel biothreats, such as new strains of flu or newly created bioterrorism reagents or compounds. Achieving production at low cost: The phase 3 goal for this program is ≤$1 per 40-µg dose for a subunit vaccine and ≤$10 per 400-mg dose for a MAb. The three phases of the AMP program are intended to demonstrate escalating productivity and product quality. Initial metrics for the first phase are to achieve ≥1 dose/L-wk for a subunit vaccine (SUV) and ≥0.025 dose/ L-wk for a full-length, folded MAb expressed in bacteria. The goal increases logarithmically for each phase. As the phases progress, the product quality metrics (specifically purity, solubility, fragmentation, and folding) increase too. In phase 1 of the program, DARPA is supporting separate efforts in fungal, marine, and plant as well as bacterial expression systems. The Xcellerex AMP program team is a collaboration among several groups to develop a high-efficiency bacterial expression system to produce a model vaccine and antibody. The team is using Pfēnex expression technology, a Pseudomonas fluorescens based expression system developed by Dowpharma. The technology is a bacterial expression system with the ability to express recombinant proteins at high titers. The system has a strong track record in producing a number of different types of complex molecules including vaccines, virus-like particles, engineered proteins such as scaffolds, and antibody derivatives in addition to fully assembled MAbs. The team is using analytical technologies called Osprey and Peregrine (developed by deltaDOT)that have the breadth to measure solubility, fragmentation, and folding not only in purified drug, but also upstream in more crude extracts of the process as production occurs. The team’s process economics and simulation modeling capability is provided by BioPharm Services. Their tools rapidly assess the economics of different technologies and improvements to optimize cost reduction and ensure that phase 3 cost targets can be met as technology is developed. Finally, Xcellerex is adapting the PDMax high-throughput screening process development and optimization platform (developed for mammalian cells) to Pfēnex expression technology. The company is also adapting its own GMP FlexFactory single-use biomanufacturing platform, including stirred-tank bioreactors and XDR mixers, to grow Pfēnex expression technology production strains to high cell densities and to purify the vaccine or MAb to homogeneity. What would it take to make 3,000,000 doses in 12 weeks? As DARPA envisions it, on day one the agency would issue either a genetic sequence or cDNA coding sequence for a therapeutic or vaccine countermeasure. In the first few weeks, using the Pfēnex platform, the countermeasure is cloned and expressed. This is followed by high-speed, high-throughput process optimization, followed by scale-up into the single-use FlexFactory technology platform. Manufacturing occurs in the last four weeks of that 12-week timeframe. The result would be delivery of 3,000,000 doses of bulk drug vaccine and/or MAb by the end of the 12th week. To put this into perspective, the number of grams (equating to three million doses) of subunit vaccine is not very large, about 120 g in 12 weeks. For the antibody, however, this would translate into producing 1.2 tons of MAb in 12 weeks. Xcellerex developed the PDMax platform for high-throughput clone screening and selection, media optimization, purification, and formulation optimization using mammalian cells. The goal is to adapt this robotic platform to achieve the same optimization capability for the Pfēnex expression technology platform. In previous experience with mammalian cells, PDMax automation has been able to rapidly improve productivity by many fold with a number of different cell lines. Similarly, the FlexFactory technology being used to produce mammalian cell-based therapeutics, has been adapted to grow the Pfēnex expression technology production strains and to purify and produce bulk drug substances (SUV or MAb products). The platform has been used previously to grow a wide range of cell lines including hybridomas, CHO cells, insect cells, and human cell lines up to the 1,000-L scale. Microbial strains have also been grown at a relatively small scale. For example, in perfusion experiments with mammalian cell lines, production comparable with that in stainless steel bioreactors was achieved at 10-L, 200-L and 1,000-L scales. This work demonstrated the scalability of the technology in mammalian systems. With insect cells, high cell densities of 44,000,000 cells/mL have been achieved in these systems, demonstrating the ability of the single-use technology to scale up and produce high levels of cells and drug. The technology has been used to manufacture products from both Chinese hamster ovary (CHO) and insect cells that are now in the clinic as US investigational new drugs (INDs). In the initial phase of the DARPA program, the focus has been to convert the mammalian bioreactor into a microbial bioreactor at the 30-L working volume scale. In subsequent phases, the microbial bioreactor platform will be scaled up to 200 L and potentially to 2,000 L for producing 3,000,000 doses of SUV or MAb in 12 weeks. 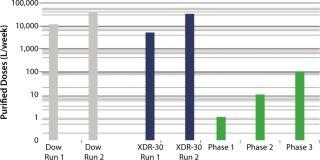 In Pfēnex expression technology, working with a variety of strains (MAb 4-4-20 and SUV HT15-Nef) at the 30-L scale, cell densities (by optical density) were comparable to those achieved by Dow stainless steel bioreactors (Figures 1, 2, and 3). SUV purified production levels (doses of SUV purified per liter of fermentor per week, assuming 3.5 × 48-hour fermentations per week) increased with project time as improvements were made. Purified production levels achieved by the XDR-30 disposable bioreactors were comparable to the stainless steel bioreactors, reaching 33,000 doses per liter per week. In addition, both exceeded the DARPA phase 1, 2, and 3 goals by several orders of magnitude (Figure 4). MAb purified production levels (doses of MAb purified per liter of fermentor per week, assuming 3.5 × 48 hour fermentations per week) increased with project time as improvements were made. 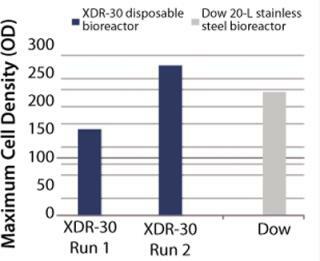 Purified production levels achieved by the XDR-30 disposable bioreactors were comparable to the stainless steel bioreactors, reaching 0.03 doses per liter per week. 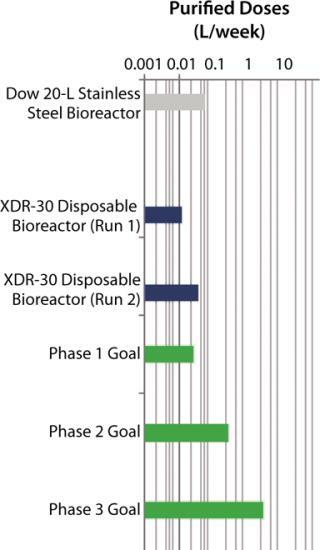 In addition, both bioreactors exceeded the DARPA phase 1 goal (Figure 5). Both MAb and SUV were purified and in fact did reach — and in some cases exceeded — the quality and purity targets required by the phase 1 program. The phase 1 results from the DARPA program with the Pfenex expression technology platform indicate that production of 3,000,000 doses of the SUV is likely to be easily achievable with a 200-L reactor in the 12-week timeframe. However, much more work will be required to reach DARPA’s goal of producing 3,000,000 doses of MAb in a 12-week timeframe. 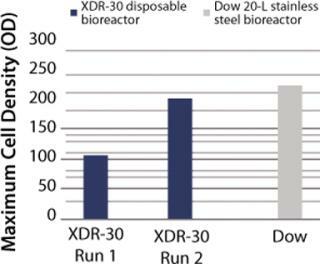 In separate work (not shown) using an XDR-30 microbial disposable reactor, a yeast strain grew to about 130 OD, reaching a level comparable to the same strain and medium in a stainless steel reactor. The same system was used to grow Escherichia coli to 120–130 OD. Based on the results of the phase 1 DARPA AMP program, the project is being considered for phase 2 under a Defense Threat Reduction Agency (DTRA) contract with a new set of higher expression, production, and quality goals. Realizing production at low cost as well as demonstrating flexibility and portability of the manufacturing system are also key goals of the DARPA program. Converting a facility to single-use equipment has been shown to reduce both capital costs and the facility’s footprint by approximately 20% percent due to elimination of significant infrastructure such as large water, steam-in-place, and clean-in-place systems, as well as the extensive piping and validation work necessary to support them. Operating cost is reduced by 10–20% (1). This platform has taken an additional key step by collapsing the amount of cleanroom space around the manufacturing equipment. This approach not only minimizes air cleaning and reduces the cost and complexity of air handling, but it frees operators from having to be in the cleanroom with it. An operator is then free to move about the plant and across different product lines and from one end to the other in a moment’s notice. Finally, paper-based systems have been converted to electronic, paperless systems. This change essentially enables GMP compliance of production operations to be monitored online in real time. As a consequence of those changes, the capital costs associated with the facility drop an additional 25% so that the overall cost is now 50% of what it was. Operating cost reduction is 25%, even with the additional cost of the disposable materials. More significantly, the construction time is reduced by 70%. Such a facility can be constructed rapidly and become operational anywhere in the world over a year’s time. This is possible because the modules can be built separately from and in parallel with the facility, and then rolled into the facility and connected to become operational. On a number of occasions, Xcellerex has built a FlexFactory system, established production, trained personnel, and then transported the facility to another location when the facility is ready for use. The first time such a “TransPlant” operation was moved from one state to another, it took only six months to f inish an existing shell facility and start GMP manufacturing for a monoclonal antibody. Subsequently, several other transfers to different locations within a city took from two weeks to one month each. In all cases, the FlexFactory system was installed in an existing shell that required finishing the validation. These rapid deployment timelines compare with 30–48 months for most facilities that are built with current technologies. Dramatic improvements in the time, cost, and flexibility of biomanufacturing have become a strategic priority for the US government as it seeks to increase preparedness for pandemic or biological threats. The initial results from the DARPA AMP program suggest the feasibility of major advances in these areas using a bacterial expression system, combined with platforms for high-throughput clone selection and optimization and modular, single-use manufacturing. Technologies developed in this DARPA program have important potential to further the biomanufacturing transformation now under way in the commercial arena. The industry’s growth, along with the rising costs and long lead times for establishing manufacturing capability — well before it is known whether a product will be effective — are increasingly driving innovations in biomanufacturing. In this environment, the ability to rapidly and cost-effectively deploy manufacturing capacity is becoming strategic capability in the private sector as well. 1.) Lim, JAC, and A. Sinclair. 2007. Process Economy of Disposable Manufacturing — Process Models to Minimize Upfront Investment. Amer. Pharmaceut. Rev. 10:114-121.